When the bowls dropped, we jumped out of the barrels. In the rambunction we didn’t notice the machines had moved in. Hundreds of them, thin and towering, light and quiet, only noticed when their combined silhouettes blotted out the sun revealing these links. 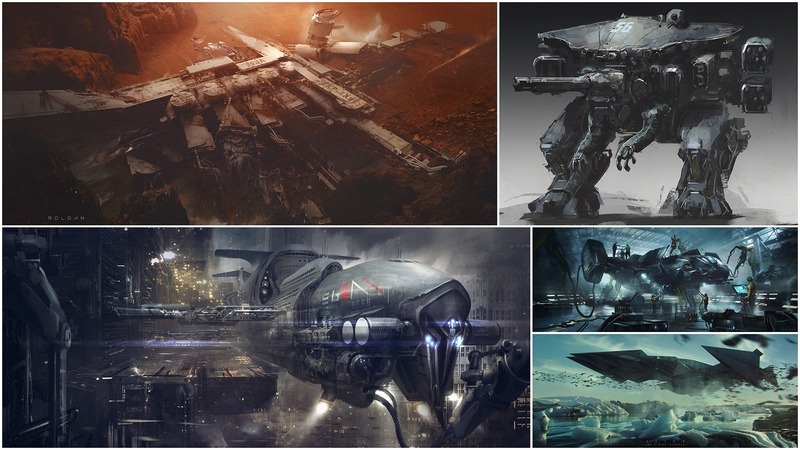 Juan Pablo Roldan – Massive scenes, ships, mechs and more. Beautiful lighting and a handle on perspective that adds loads of depths. What the Fog – Mark Broyer is a freelance Art Director and Designer living in Hamburg, Germany. He likes to take photos. These are photos of Hamburg at night. Beginners Guide to ZBrush – If you’re interested in learning the popular sculpting program, this will get you started. Coming out soon, but pre-order available. Thunder Lizard – Like Stranger Things? Well, you know Dustin of course. He sports a cool sweatshirt from the Science Museum of Minnesota. This is where you can get it. Dali Atomicus – How photographer recreated the famous 1948 portrait of surrealist painter Salvador Dalí by Philippe Halsman. And how it was done. Banned – The 10 coolest cars banned in the United States. From the Bugatti EB 110 SS to the Nissan Skyline GTR. Re:scam – Passive aggressive much? When it comes to email scams this is the tool to use. Re:scam will take care of it, trolling the scammers so you can get on with your day-to-day. Mumbo Jumbo – Her debut video. Starts off weird, but don’t worry, it gets weirder.